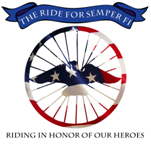 We’d like to give a shout out to our friends at The Ride for Semper Fi, a 430-mile cycling adventure that begins in Phoenix on October 13 and concludes three days later in San Diego. The goal is to raise $177,500 for the Injured Marine Semper Fi Fund by the time the cyclists end the ride at Sea World on Oct. 16. In their words: “We are not professional athletes or career fundraisers, but we are people who want to give back to those Marines who have sacrificed so much of themselves in order to fight for our country.” For more information, visit the Ride for Semper Fi web site. During a recent market trip to Arizona, we met one of the riders, Joshua Aylesworth. He invited us to donate some wine for the ride’s upcoming fundraising event on October 2, and we obliged, of course. We wish Joshua and all of his fellow riders happy trails as they pedal west for a great cause!